Binge eating disorder is defined as binge-eating episodes not accompanied by purging for at least 2 times per week for at least 6 months. Today physicians recognize this condition as a complex and potential serious problem. Around 30-50 percent of subjects in organized weight control programs have binge eating condition. However, many more people in the world are likely to have less severe forms of this disorder that do not meet the formal criteria for diagnosis. The number of cases for binge eating is far greater than that of either anorexia nervosa or bulimia nervosa. Eating, in a discrete period of time (e.g., within any 2-hour period), an amount of food that is definitely larger than most people would eat during similar period of time in similar circumstances. A sense of lack of control during the episode, for example, a feeling that one cannot stop eating or control what or how much one is eating. The behavior does not occur only during the course of bulimia nervosa or anorexia nervosa. This condition is mostly managed through nutritional counseling. Binge eaters are helped to recognize their own buried emotions in anxiety-producing situations, and are encouraged to share them with their therapist or counselor. 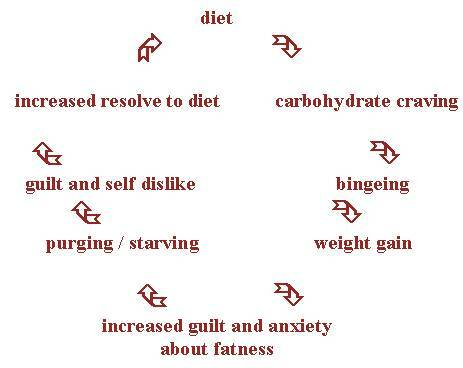 Binge eaters are helped to learn simple but appropriate phrases to say to one-self when the desire to eat is strong. Dietary advice ranges from avoiding restraint in eating to limiting binge foods. Some experts feel that learning to eat all foods, but in moderation, is an effective goal for binge eaters. This practice can prevent the feelings of depression and deprivation that come from limiting particular foods. Antidepressants, such as fluoxetine (Prozac), and other types of medications also have been found to help reduce binge eating disorder in these individuals by decreasing depression. General people who have this disorder are usually unsuccessful in controlling it on their own. Thus professional help is advised.